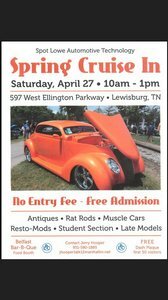 Please join us for our Spring Cruise-In. Thank you to commissioner Craig Blackwell, Phillip Baxter (A Plus Collison) for the tow, and Nissan Jeff Lyttle (pictured), Matt Taylor and Kevin Hines for donating the Nissan SUV to our Automotive Program. Each month the Marshall County Rotary Club honor selected students. Below are the students nominated by their teacher to receive this honor.